Delivering a diameter of 28mm a coming in a 6×24 strand construction with a fibre core on every bundle, this 28mm 6×24 galvanised wire rope is one of the most adaptable options we produce here at Rope Services Direct. What are the benefits of 28mm 6×24 Galvanised Wire Rope? Wire rope which has been galvanised as part of the manufacturing process will not end up with corrosion forming on its outer surface. This minimises the issues associated with using it outdoors, as well as in marine settings. 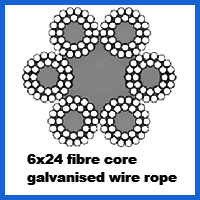 The 6×24 structure of this rope is another benefit, since it partners up steel wires with fibre strands. This means it can flex more easily and thus make light work of lashing duties for forestry operations and maritime organisations. Measuring 28mm across, the diameter of this rope affords it a 43,859kg WLL and a breaking force of 430kN. It is more easily crushed than wire core galvanised rope, so keep this in mind when deciding if it is right for you. We work with our customers to make sure the wire rope they order is setup up in the exact way they require. This can include fittings of many varieties, or assemblies that are tailored to match your specs. You can speak with a specialist at RSD by giving us a call on 01384 78004. We are also contactable online, so you should have no trouble getting your questions answered or requesting a quote for galvanised wire rope. 28mm 6x24 Galvanised Wire Rope Overall rating: 5 out of 5 based on 6 reviews.